The noontime parade estimated by some to number 600 or more was spearheaded by Inca-attired performers and with many of the marchers holding aloft signs reading JUSTICE FOR FIL-AM VETERANS! FULL EQUITY NOW! NO TO WAR FUNDS FOR VETERANS! K(NO)W JUSTICE K(NO)W PEACE! Give credit where credit is due Pilipinos fought for American, too! Banks got bailed out Veterans sold out! as well as the militant-themed Makibaka Huwag Matakot! and U.S. OUT OF MINDANAO! It was a largely peaceful and orderly procession mostly on foot by members of the Justice for Filipino American Veterans (JFAV) and allied organizations. A few veterans clearly in their advanced years rode on cars. 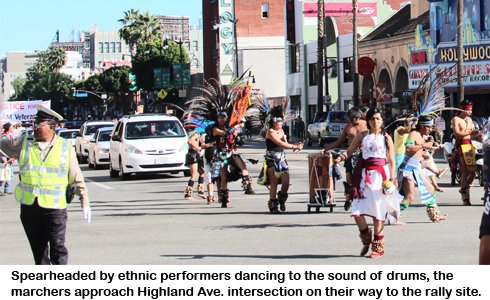 However, a demonstration participant named Plaridel later complained about alleged bullying and shabby treatment during their permitted mass action by cops from LAPD’d Hollywood division. “I just feel so sorry for our youth and the elderly being treated like hooligans,” he said in a Facebook posting. Another described it as racist suppression. Still another said the cops were white supremacist Ku Klux Klan members. 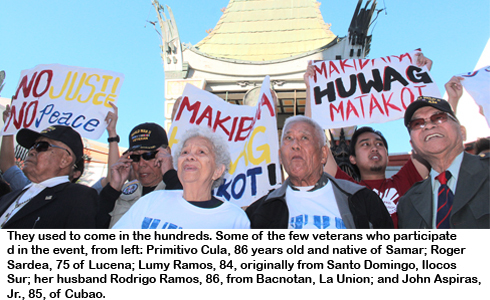 In front of Grauman’s speakers took turns voicing out protests against what they claimed was the continued callousness of government agencies concerned in denying justice and equity to Filipino veterans of World War II. Among the speakers were veterans John Aspiras and Heidi De La Torre, Christine Araquel of People’s CORE, Mike Pedro of JFAV-Los Angeles, Kabataang Makabayan chair Ernest Tamayo and Aileen Ignacio of UCLA’s Kuppa PSI Epsilon. According to Art Garcia, national coordinator of JFAV, more than half a million Filipinos fought as American soldiers and guerrillas under American officers during that war. On February 18, 1946, just before the US government granted the Philippines its nominal independence, the US Congress passed the Rescission Act of 1946 that took away the rights and benefits of those Filipino soldiers. For more than six decades the veterans fought for recognition as full-pledged American veterans and the restoration of their benefits. After so many years some benefits came trickling in, piecemeal. Then in February 2009 the president signed the American Recovery and Reinvestment Act passed by the legislature. 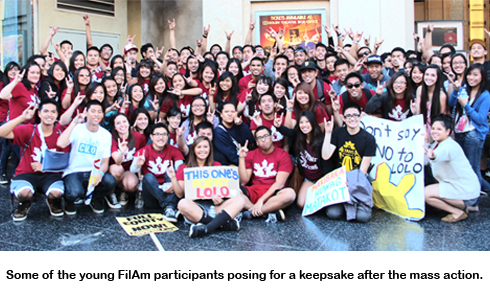 It contained a provision that compensates Filipino veterans for their war service. It grants a one-time lump sum of $15,000 for veterans who have become US citizens and $9,000 for those who retained their Philippine citizenship. However, according to Philippine Ambassador to Washington, DC Jose L. Cuisia, Jr. more than 24,000 Filipino veterans were disqualified from the Filipino Veterans Equity Compensation Fund program. Retired Maj. Gen. Delfin Lorenzana, head of the Office of Veterans Affairs at the Philippine Embassy, said the disqualification issue stemmed from guidelines that require that the names of veteran-claimants appear in both the Roster of Troops and the Discharge List prepared by the US Army at the end of the war. The disqualified veterans comprise 56 percent of the 43,083 surviving veterans who filed their claims under the compensation fund, General Lorenzana said, adding that the US Government has so far released a total of $223.7 million to 18,698 Filipino veterans from the $265-million ARRA fund.